If you are finding it difficult to locate the right theme for your portfolio website, you are in the right place. This article will show you our best professional WordPress portfolio themes, giving you a good idea for how your perfect portfolio website should be. We’ll provide a quick description of each theme telling about it’s benefits and features that make them the ideal themes for any portfolio website. Shutterbox is a theme created for artists, designers, and photographers to showcase their work in a minimal portfolio layout. This theme is ideal for creatives who want to display their work in an asymmetrical full-page layout. Stand out from other websites using this easily customizable theme which includes tons of gallery layout options. Asymmetrical Design – Show portfolio and blog entries in a unique layout. Full-Width – Includes a full-width front page template for showcasing your portfolio and blog. Welcome Message – Supports an optional welcome message and button. Contact Area – Display a map and address for your business on the homepage. Homepage Masonry Layout – Display your galleries in a masonry design on your homepage. 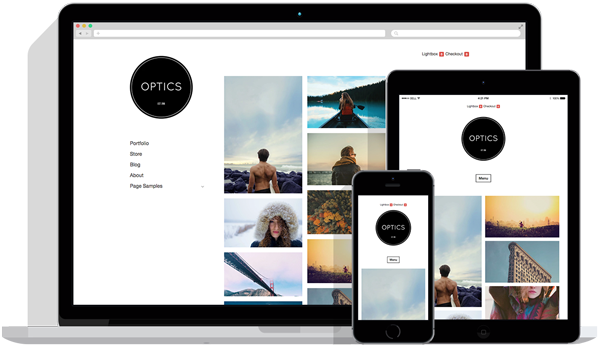 Optics Pro was created to minimally power portfolio, blog, and e-commerce stores. This theme features a left-aligned menu with masonry layout options on the homepage. Build brand awareness and include your logo in the top left side of the homepage above the menu. Optics allows you to display your work in a clean and simple design unlike any other theme. Left-Hand Header Layout – Your logo and menus will appear on the left side of the page. Self-Aligning Masonry Layout – Display your portfolios, or store images in a self-aligning masonry grid layout. Pro Gallery Lightbox – Beautiful gallery lightbox for displaying big photos with thumbnail navigation. Photo Gallery Layouts – Show masonry, tiled, or slider photo galleries. Mega Menus – Create mega menus for maximum organization and navigation. Lookbook, one of our portfolio and photography themes with a unique mosaic-styled design. Display your photos in a unique mosaic design standing out from other websites. This themes gives visitors the ability to save low resolution copies of your photos to a digital PDF. This features helps future customers remember their favorite work. Lookbook Feature – The ultimate feature of Lookbook allows visitors to save copies of your photos to a downloadable PDF file. Builds a Client List – Lookbook helps you build a list of clients by saving the email address of those who have downloaded your lookbook. Full-page Masonry Layout – Display a masonry layout of images that take up the whole screen of your homepage capturing each photos quality. Collapsable Menu – Website menu will appear as a small icon until clicked then you can view the different menus and pages. Clean Homepage Layout – Visually clean homepage design that is easy to navigate displaying your photos or galleries in a masonry layout. Qua allows to customize your website to reflect the passion and quality that you put into your work. This theme is perfect for portfolio, blog, and e-commerce websites. Qua comes with a huge number of customization options that make it possible to have a clean and simple website that gives a professional first impression. Header Slideshow – Choose from a variety of layouts such as blog, slideshow, and portfolio layouts. Portfolio Integration – Keep the original images and display them in masonry-style without having to crop the images. Custom Welcome Message – Add a non-interruptive welcome message displayed on the homepage. Symmetrical Grid Layout – Display a multi column grid of galleries on the homepage of your website. Multi Column Content – Content and blogs can be displayed in multiple columns similar to the look of a newspaper. Composition is our newest theme designed for creative artist who want to make a visual impact to have a lasting impression. This themes comes with tons of customization options and features that allow anyone to create any kind of website. Display large fullscreen images in the header. Tons of customization options makes anything possible with this theme. Prominent Search Box – Ideal for stock websites. The search box appears over the header of your website, adding visual impact. Mega Menus – Organize your navigation using mega menus. Adaptable Design – Choose between one, two, three, or masonry column layouts. Header Images – Display a large full page header photo on the dashboard of your site. Slideshows and Galleries – Show off images using integrated slideshows and gallery layouts (tiled or masonry options). Sider a beautiful horizontal layout theme, perfect for photographers and artist who want to display their work in a unique way. The side-scrolling slideshow affect on the homepage makes this a game winner for many artists. It’s easy to customize and gives your visitors a stunning visual impression with easy navigation. Side Scrolling – Unique horizontal and side-scrolling layout. Fonts – Tons of fonts to choose from. Customizable Front Page – Customizable front page options. Gridspace is our portfolio theme designed specifically for portrait photos. Capable of showcasing vertical, horizontal, and square images. This theme is easy to set-up and customize with a great amount of features that include many front page layout options. Grid/List View – Toggle between grid and list view for portfolios and blog entries. Left-Hand Header Layout – Your logo and menus appear on the left side of the page. Homepage Galleries – Display your galleries on the homepage in a symmetrical and organized layout. Clean/Modern Design – Clutter-less design so visitors can focus on your work. Wall Street is a theme created for photographers and entrepreneurs who want to display their work and services in a professional way. This theme contains a full-width image slider so you can present your work directly on the homepage. With tons of customization options you can wow visitors and turn them into customers. Full-width Image Slider – Showcase your best work in a full-width slideshow on your homepage. Add Your Logo – Show your logo overlapping the slideshow on your homepage building brand awareness. Call-to-Action Button – Add a button on the homepage slideshow encouraging visitors to take action. Display Portfolios – Showcase your portfolios underneath the slideshow in a grid layout. Services – Add a services section on the homepage to explain the benefits of your business and why they should choose you. Chromatic is the ultimate theme to beautifully showcase your portfolios and photos. This theme includes tons of customization options including fullscreen homepage slideshows and a custom menu. If you’re looking to take your website to the next level, this is the perfect theme for you. Fullscreen Image Slideshow – Display a fullscreen slideshow on your homepage presenting your best work. Add Your Logo – Build brand awareness by showing your logo on the homepage. Collapsable Menu – When clicking on your logo the menu will appear from the sidebar. Change View Order – Toggle between grid and list order when viewing portfolios on the homepage. Grid Layout – Display portfolios in a organized grid layout. Auditorium is our theme designed for displaying video and photo galleries. Showcase video and image slideshows on the homepage immediately giving visitors an example of the work you do. Video and Image Slideshows – Present a huge video and image slideshow on the homepage. On Page Video – When playing videos in the slideshow you will not be taken to another page the video directly plays on the page. Add Content – Add content below the slideshow telling visitors more about your website and services. 350 Font Options – Choose a font for headlines and one for body elements between a list of 350 fonts. Mobile Ready – This theme is responsive on mobile devices so the video and website experience won’t be affected.